This morning dark clouds covered our skyline. It looked like quite the miserable rainy day. Normally the idea of a wet day makes me feel a little glum and out of sorts. I dislike going out in the rain because our funny four year old little boy Jaden, loves to play outside, and its impossible for him to stay dry. Rain means puddles, puddles mean splashing, and splashing means soaking wet child – Jaden. Jaden loves the wet weather, and loves playing outside, and in the puddles at every opportunity. Keeping Jaden dry on a wet day is next to impossible – raincoats and umbrellas often fail us! I am sure he searches out ways just to frustrate his ‘Mischievious mum, but now we have the answer! A few weeks ago, I was contacted by a lovely couple via Instagram who sell the best ever rain and puddle protection for children who love to play outside – even in the wet weather. I am sold!! Every child should have one of these – they are the best waterproof splash suits for kids I have ever seen, and I’ve seen a few! Check them out here. There are also shark options for the boys, and a fairy one for the girls. This is the best comfortable waterproof suit for kids. 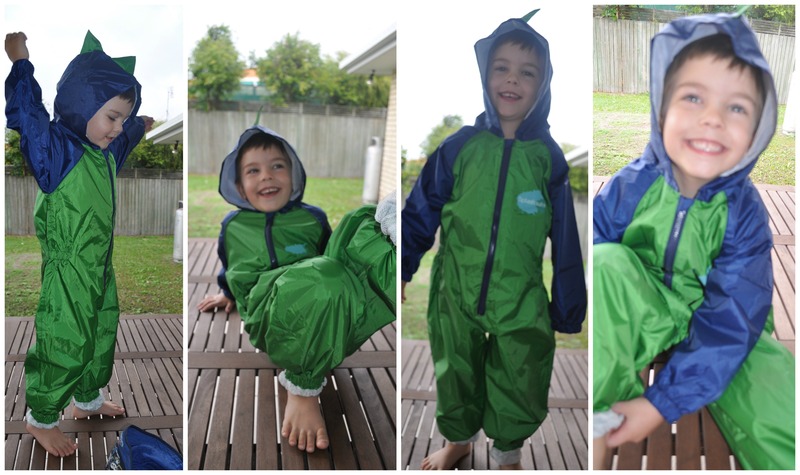 Jaden can’t wait for the next bout of rain so that he can wear his Dinosaur splashsuit. For more information on the waterproof splash suits for kids, click here.